Trewythen Lodges in Powys sleeps between 2 and 4 people, with the accommodation being lodges. Trewythen Lodges is part of our Autograph Lodge Holidays Collection and command a breathtaking location with spectacular views across the rolling mid Wales countryside. 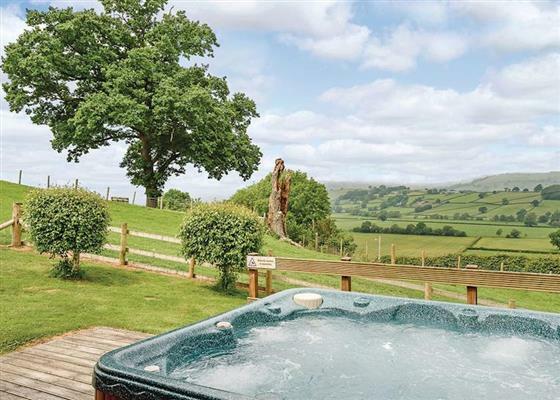 Each lodge has been well appointed to make the most of the stunning views yet is only two miles from the pretty villages of Caersws and Llandinam, with an array of pubs and shops serving and selling fresh local produce. Each lodge has been individually styled with every comfort in mind. Stylish contemporary furniture blends effortlessly with the light timber interiors creating a wonderful retreat from which to enjoy the glorious surrounding countryside and impressive views. You can even enjoy a delightful range of body treatments and massages in the comfort of your own lodge (charges apply). Each lodge features its own covered balcony with extending decking area home to a sumptuous outdoor hot tub – the ideal accompaniment for a romantic break or a relaxing escape. If you want to find out what other people have said about Trewythen Lodges, read the reviews on Trewythen Lodges for more information. And, for those last minute bargains, have a look at some of the special offers available at Trewythen Lodges. Brand new for 2010. 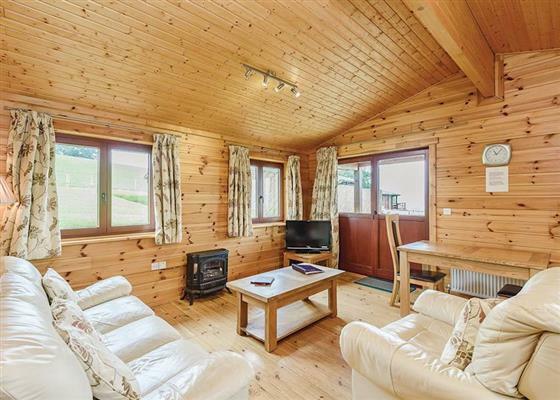 Exclusive lodge with 5ft double. Bathroom with corner bath and separate shower. Perfect for romantic breaks at any time of year. Sauna. Outdoor hot tub. Luxurious and spacious lodge with one double with ensuite shower. Separate bathroom with bath with overhead shower. Perfect for romantic breaks at any time of year. Outdoor hot tub. "Luxurious lodge with 5ft double with ensuite shower, flat screen TV and DVD. Infrared sauna/dressing room. Perfect for spoiling someone special. Outdoor hot tub." Exclusive lodge with one double with ensuite shower and one twin. Bath with overhead shower. Sauna. Outdoor hot tub. Find out about Trewythen Lodges, including prices and availability. There aren't currently any special offers at Trewythen Lodges however, the special offers shown below are all on parks within 30 miles of Trewythen Lodges - so you may find these useful. Holiday at Superior 2 in Gwynedd starting on Saturday 27 April 2019 for 7 nights. Holiday at Superior 3 in Gwynedd starting on Saturday 27 April 2019 for 7 nights. Holiday at Seascape in Gwynedd starting on Saturday 27 April 2019 for 7 nights. Holiday at Kingfisher Plus in Shropshire starting on Saturday 27 April 2019 for 7 nights. Holiday at Goldcrest VIP Lodge in Shropshire starting on Saturday 27 April 2019 for 7 nights. Holiday at Oak VIP Lodge in Shropshire starting on Saturday 27 April 2019 for 7 nights. Holiday at One Bed Apartment in Powys starting on Saturday 04 May 2019 for 7 nights. Holiday at Two Bed Apartment in Gwynedd starting on Saturday 04 May 2019 for 7 nights. Holiday at Three Bed Apartment in Gwynedd starting on Saturday 04 May 2019 for 7 nights. Holiday at Goldcrest VIP Lodge in Shropshire starting on Saturday 04 May 2019 for 7 nights. Holiday at Superior 2 in Gwynedd starting on Saturday 11 May 2019 for 7 nights. Holiday at One Bed Apartment in Powys starting on Saturday 11 May 2019 for 7 nights. There are 44 holiday parks within 15 miles of Trewythen Lodges. 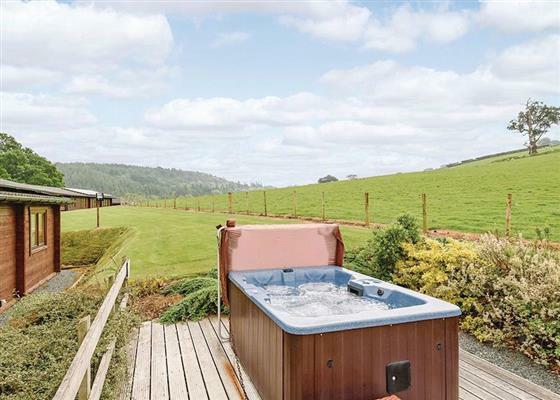 Upper Close in Walton, Powys, and sleeps 8 people. 24 miles. Acanthus Cottage in Welshpool, Powys, and sleeps 4 people. 20 miles. Little Brampton in Clunbury, Shropshire. 23 miles. The Owl House in Welshpool, Powys, and sleeps 2 people. 15 miles. Oaklands in Dolgellau, Gwynedd. 23 miles. The Old Railway Tavern in Clun, Shropshire, and sleeps 6 people. 24 miles. White Hopton House in Sarn, Bishops Castle, and sleeps 12 people. 13 miles. Tupsley House in Hereford, Herefordshire, and sleeps 12 people. 45 miles. Treburvaugh House in Knighton, Powys, and sleeps 16 people. 19 miles. Bwythyn Glas Y Dorlan in Llandeilo, Dyfed. 48 miles. Bodlondeb Cottage in Clwyd, , and sleeps 4 people. 42 miles. Yarchester Barn in Much Wenlock, Shropshire. 37 miles. The Lowe Farmhouse in Much Dewchurch, Herefordshire, and sleeps 14 people. 47 miles. Glandwr Terrace in Blaenau ffestiniog, Gwynedd, and sleeps 3 people. 40 miles. The Manor House at Plas Meini in Llan Ffestiniog, Gwynedd. 38 miles. Gwardolau Cottage in Rhayader, Powys, and sleeps 6 people. 13 miles. Llofft Allan in Ardudwy, Gwynedd, and sleeps 2 people. 34 miles. Llangain Farmhouse in Wye Valley, Herefordshire, and sleeps 8 people. 34 miles. Filbrenik in Dudleston Heath, Shropshire, and sleeps 8 people. 36 miles. Cefn Colwyn Barn in Caersws, Powys, and sleeps 4 people. 2 miles. Grove View in Leominster, Herefordshire, and sleeps 6 people. 38 miles. Crabapple Cottage in Oswestry, Shropshire, and sleeps 4 people. 26 miles. Craig Y Rhos in Machynlleth, Powys, and sleeps 6 people. 13 miles. The Cauldron in Blaenau Ffestiniog, Gwynedd, and sleeps 2 people. 40 miles. Hendre Barn Mawr in Abergynolwyn, Gwynedd, and sleeps 8 people. 23 miles. Garth Y Pistyll in Llangollen, Clwyd, and sleeps 6 people. 35 miles. Coedfryn in Llandeilo, Dyfed, and sleeps 8 people. 41 miles. Longlands in Hay-on-Wye, Herefordshire, and sleeps 10 people. 32 miles. The Town House in Bala, Gwynedd, and sleeps 8 people. 29 miles. Maes-yr-Adwy in Abergorlech, Dyfed, and sleeps 8 people. 44 miles. Henllys Lodge in Llandovery, Carmarthenshire. 37 miles. Hirros Hall Longhouse in Welshpool, Powys, and sleeps 6 people. 11 miles. Troopers Barn in Church Stretton, Shropshire, and sleeps 12 people. 29 miles. Criftin Farmhouse in Bishops Castle, Shropshire, and sleeps 8 people. 23 miles. Pottre Farmhouse in New Quay, Ceredigion, and sleeps 8 people. 44 miles. Bedw Barn in Newtown, Powys, and sleeps 14 people. 5 miles. Craigllwyn Farmhouse in Oswestry, Shropshire, and sleeps 11 people. 27 miles. Far Hill Cottage in Trewern, Welshpool, and sleeps 5 people. 22 miles. The Coach House in Lampeter, Wales, and sleeps 20 people. 35 miles. Glanyrafon Bungalow in Rhayader, Powys, and sleeps 6 people. 11 miles. Woodbine Cottage in Ludlow, Herefordshire. 36 miles. Rosehill Manor in Market Drayton, Shropshire, and sleeps 20 people. 47 miles. Wendon in Pwllheli, Gwynedd. 49 miles. Riverside Cottage in Dolgarrog, Gwynedd, and sleeps 2 people. 49 miles. Bronawel in Oswestry, Shropshire, and sleeps 11 people. 26 miles. Morrells Wood Farm in Shrewsbury, Shropshire. 40 miles. Llwyncrwn Farm Cottages in Llandysul, Carmarthenshire, and sleeps 2) people. 49 miles. Holly Farm Cottage in Llandrindod Wells, Brecon Beacons, and sleeps 6 people. 20 miles. The Balance Farm in Kington, Herefordshire, and sleeps 14 people. 27 miles. Trederwen House in Welshpool, Powys, and sleeps 12 people. 22 miles. Sisial Y Llyn in Bala, Gwynedd, and sleeps 9 people. 29 miles. Penlan House in Barmouth, Gwynedd, and sleeps 10 people. 29 miles. Shepherds Rest Cottage in Ludlow, Shropshire, and sleeps 6 people. 38 miles. Bolstone Court in Little Dewchurch, Herefordshire, and sleeps 15 people. 49 miles. Tynrhyd Retreat in Aberystwyth, Ceredigion, and sleeps 28 people. 19 miles. Friary Cottage in Ludlow, Shropshire, and sleeps 6 people. 33 miles. Maes Rheidol in Aberystwyth, Dyfed, and sleeps 7 people. 23 miles. Hindwell Farmhouse in Presteigne, Powys, and sleeps 10 people. 24 miles. Bearwood House in Leominster, Herefordshire, and sleeps 10 people. 31 miles. Buttercups Haybarn in Whitchurch, Shropshire, and sleeps 10 people. 44 miles. Kingfisher at Maesydderwen Holiday Cottages in Llandeilo, Brecon Beacons National Park, and sleeps 10 people. 47 miles. The Cider Barn in Hereford, Herefordshire, and sleeps 14 people. 41 miles. Burrills View in Craven Arms, Shropshire, and sleeps 6 people. 25 miles. The Grange at Hencote in Shrewsbury, Shropshire, and sleeps 12 people. 34 miles. The House in the Hills in Hay-on-Wye, Brecon Beacons National Park, and sleeps 10 people. 36 miles. Old Vicarage in Llangenny, Crickhowell, and sleeps 14 people. 47 miles. Alexanderstone Manor in Brecon, Powys, and sleeps 12 people. 38 miles. Leaton Corner in Bomere Heath, Shropshire, and sleeps 4 people. 33 miles. Manor Wood in Coddington, Cheshire, and sleeps 10 people. 49 miles. Devil's Bridge Retreat in Aberystwyth, Cardiganshire, and sleeps 28 people. 19 miles.